Characterize the technical attributes of all data objects that have a particular type. Either built-in or defined types. Each data object has a particular type & occupies its own memory space. A data field in ABAP is a variable which cannot be broken up into smaller parts. All data fields that are to be used in a program must be defined before their first use. 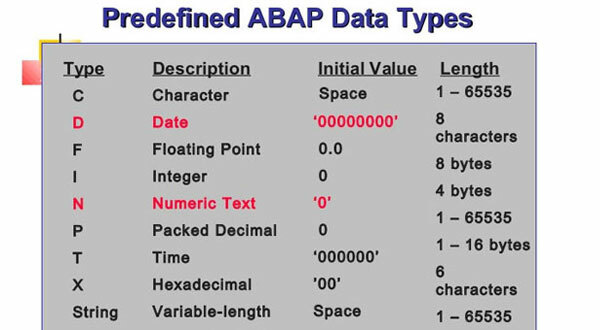 Data fields in an ABAP program have a type. E.G. You can define a data field student_name of type character and length 25 as:data student_name(25) type c.
numbers stored in compressed formats, ie, 2 digits per byte of storage. Data postcode(4) type n value ‘4001’. Data counter type i value 1. Data price type p decimals 2. Data: DOB like sy-datum, counter type i.
WS_SUM1(5) TYPE P DECIMALS 2. Constants are declared like fields with the addition of the valueclause. Constants: max_counter type i value 9999. 'ABC' , ' THIS IS A TEXT '.SEQUENCE OF UP TO 255 CHARACTERS ENCLOSED IN QUOTATION MARKS. 715, -431 .SEQUENCE OF DIGITS , NEGATIVE NO. 'S WITH A PRECEDING SIFN. Field strings consist of a series of variables grouped together under a common name. Field strings are defined using the keywords begin ofand end of.data: begin of customer,id(8) type n,fname(12),lname(15),end of customer.customer-id = ‘12345678’.customer-fname = ‘Christain’.customer-lname = ‘Wong’.write / customer.write: / customer-id,customer-fname,customer-lname. NAME CANNOT CONSIST OF ONLY DIGITS. 1.ALWAYS USE A LETTER AS THE FIRST CHARACTER. OTHER CHARACTERS MAY BE LETTERS / DIGITS. 2.JOIN INDIVIDUAL WORDS BY UNDERSCORE. Student_tab type student_type occurs 0. SUM1(5) TYPE P DECIMALS 2. Same name can not be used for a parameter & a field in an ABAP/4 statement. len = LENGTH OF FIELD IN BYTES. (*) DEPENDS ON LARGEST NUMBER TO BE DISPLAYED. Any type can be converted to type C, but the reverse is NOT true. DO NOT transfer non-numeric values to numeric types. Last (len) characters in case of type N.
User defined structures are declared using the typeskeyword. Constants are declared using the constantskeyword. 1.Create a report (‘ZEXC_DATATYPE_NNNNNNNN’) using transaction ‘se38’. 5.Create 2 variables of type x_type3 (WS_var3 & WS_var4). 6.Assign values to WS_var1 & WS_var2. 7.Populate WS_var3 with the previous variables and current date and current time. 8.Populate WS_var4 with the values from WS_var3.